In 2012 the key to successful branding will be ENGAGEMENT, RELEVANCE, AFFILIATION AND AMAZEMENT. 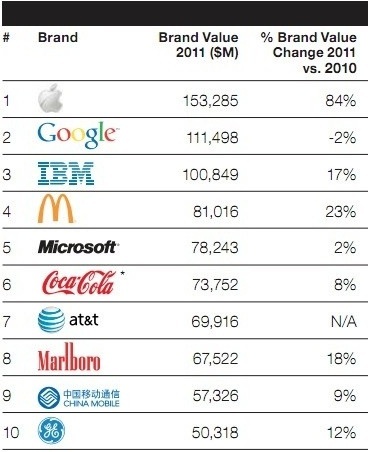 In its yearly study about branding “BrandZ Top 100 Most Valuable Global Brands 2011” WPP had some interesting observations about the companies making the biggest mark on their fans. You can download the document on SlideShare here. It’s something I’ve been noticing a lot with ANY kind of successful branding. From consumer retail, tech start ups and large pharmaceuticals through to personal branding developed by performers of all kinds there has been a definite shift in 2011 towards branding and reality. How “real” is a brand? Does it reflect the issues affecting our culture, our well being today? Is it accountable for its actions? Transparent? Does it make its audience / consumers feel better about themselves for using its products or services. Does it speak directly to me? Does it know me? – Assertion of individuality: The surge of personal expression empowered by the Internet was matched by a consumer preference for personal expression in apparel and other products, resulting in a trend to the bespoke (for those who could afford it) or mass customization (for everyone else). – Concern for personal health and wellness: Consumers, across economic groups, paid more attention to the food they put in their bodies (improvements in fast- food menus) and the products they put on their bodies (changes in personal-care ingredients). – Concern about the environment: Consumers weren’t willing to pay any price for environmentally friendly products, but being “green” became a hygiene factor in some categories (the introduction of more hybrid and some electric cars). – Concern about product provenance: Consumers wanted to feel good about their possessions. They wanted peace of mind, knowing that any pleasure they derived from owning a product did not come at the expense of the people who made it. It will be interesting to see how these values adapt for 2012 and which messages will prove the most potent. No prizes for guessing that concerns about safeguarding finance, sustainability and trust could be high on the list. This has been seen in the advertising world for some time as brands revert to old marketing campaigns, evoking an era when there was theoretically more ‘ethic’ in business. Or making a lot of noise about the fact they have been in business for X million years. Marks & Spencer campaigns since 2010 often focus on their commitment to providing top customer service since 1884 for example. Returning to London Gatwick the other day also reminded me of British Airways’s revert back to their original slogan and branding ‘To Fly To Serve”. – Relevance: Consumers are less willing to be lead by brand ideals and need a higher level of personalisation from the brands they buy into. Personalisation in this instance meaning speaking to them on their level, using their language, in their location. – Affiliation: Consumers need to see that a brand is affiliated with the issues or people that they care about. More than ever, clever placement, partnerships and positioning are impacting a brands success on a scale never seen before. If you wonder why I’ve linked to a Dynamo video, for me this newcomer to the UK entertainment scene embodies all of those aspects: Engagement, Relevance, Affiliation and Amazement. This entry was posted in Branding, Social Media, Trends and tagged 2012 trends, Branding, BrandZ, digital media, Dynamo, Marketing, social media, Trends, WPP by amandalorenzani. Bookmark the permalink.